Combining broad-spectrum antimicrobial action with bacterial toxin management and odor control, dressings may help reduce infection in partial- and full-thickness wounds, embedded silver particles kill bacteria and fungi, while a highly porous, activated charcoal layer binds toxins and odor-causing molecules, exudate is allowed to flow freely through to a secondary absorbent dressing; the outer nylon sleeve facilitates removal with minimal adherence to the wound. Embedded silver particles kill bacteria and fungi, while a highly porous. li>Activated charcoal layer binds toxins and odor-causing molecules. 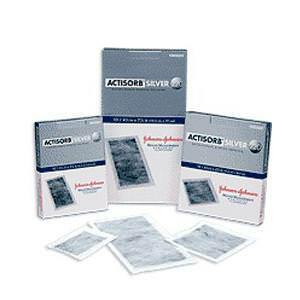 Exudate is allowed to flow freely through to a secondary absorbent dressing; the outer nylon sleeve facilitates removal with minimal adherence to the wound.